Hyundai’s hatch stokes our inner hipster. ASSOCIATE EDITOR GRAHAM KOZAK: What an odd little car. I’ll admit that I’m partial to the Veloster, or at least the idea of it. I like the bold styling, I like the useful 2-plus-1 door configuration and I like the name. It sounds fast! I’ll even own up to digging the hipster-bait C3 Roll Top concept Hyundai rolled out a few years ago. I think with a little bit of refinement, it could be a really great car -- certainly, it’s got a lot of character to play with. As it is, it’s still a decent car that offers a great value. But it’s not exactly a modern incarnation of … a CRX, maybe? I’m not sure exactly what the Veloster is trying to be, except funky. Which might partially explain why it’s not quite the exceptionally awesome overall package it might have been. The 1.6-liter turbo could be a defining feature here. But while it’s better than the naturally aspirated base motor, it really didn’t impress me much. In the era of anonymous 2.0-liter turbos, I don’t mind a bit of lag and bite -- it's what makes the WRX STI fun, after all. Power doesn’t come on fully until 6,000 rpm here, and it runs out of steam soon after. Technically, you could call it a peaky motor, but the peak itself isn’t so high in the first place. More like a hill, maybe. A somewhat tricky clutch makes stop-and-go traffic a drag. Once you get going, and get some momentum into the car, it all strings together fairly well. It’s not particularly stiffly sprung, but it seems happy to rotate if you keep on the power. There’s potential here -- if this thing came out in the heyday of tuning, I feel like we’d see a lot of really cool builds with the Veloster at their core. 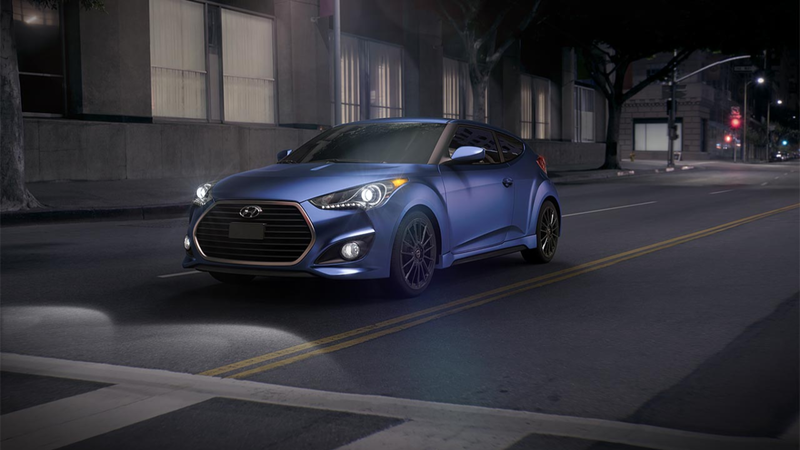 At under $24,000, which includes the faux-center-lock wheels and matte blue paint, the Rally Edition Veloster Turbo might still serve as a perfect blank canvas. It’s less than 3,000 pounds, too! I’d really love to see what a genuine Hyundai geek (note: I don’t mean a SEMA-crazed tuning shop) could do with these oddball bones. But again, as it is, it’s a surprisingly practical, high-feature hatch. ROAD TEST EDITOR JAKE LINGEMAN: Hyundai nailed it with this, aside from the weirdly shaped exterior. And even that, which isn’t quite my style, is cool because it’s unique. I do like the matte paint option whenever it’s available. I don’t like the care that has to go into maintaining it, but that’s a tradeoff. Power is punchy from the turbo four and had me smiling with surprise when the boost kicked in. It does choke for split second when you shift at max rpm, but it’s plenty quick. It sounds good, too -- nice little grunt from the engine bay. The six-speed is rock solid and the throws are short. That makes it extra fun to bang through the gears. AND Hyundai fixed its clutch pedal. The last Genesis coupe I drove was quick and fun, but the clutch didn’t have enough spring or weight to it, it sort of just retracted slowly, on its own. No problems here, though. The ride was a little rough, stiffer than the VW GTI and Focus ST, I think. I did make an effort to avoid potholes. But, the buyers of this Frankencar probably won’t care. They’ll be either Hyundai fans or enthusiasts, and they’ll be fine. The interior was a little cheap looking, but that’s what you get for $22,600. I don’t think there will be any complaints. The seats are comfortable, and somehow they seem worn in, but I know they’re not. The radio setup is great. Will people opt for this over the slightly more expensive options from Ford and VW? I’m not sure, but I don’t think they’d be disappointed if they did. EDITOR WES RAYNAL: I must say the price is impressive. I found myself wincing on the way to work this morning at the thought the sticker might hover closer to 28K or so. 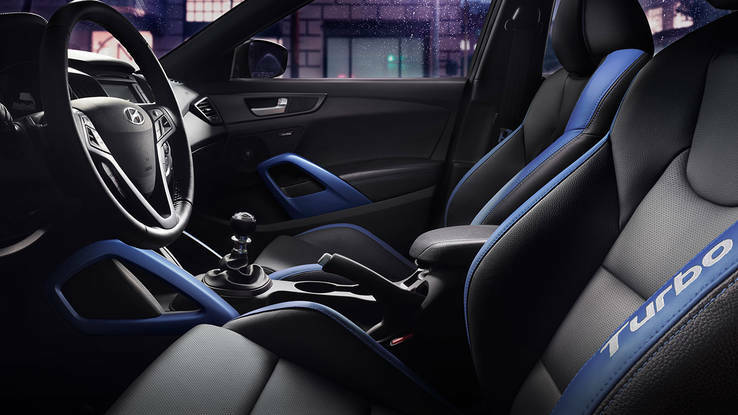 This Rally Edition means a paint job, wheels and tires, blue interior accents … you know the drill. Yeah, it looks goofy but it drives nicely and I suppose styling is up to the individual. I’m not feelin’ it personally. Some people might love it. It actually looks kind of cool from the back. It ain’t cookie cutter, that’s for sure, so at least you won’t see yourself coming and going much. The 201 hp figure seems like less on the road until you get the tach swinging beyond 3,500-4,000 rpm, then things get fun. The turbo also makes this engine quite a bit more flexible than the normally aspirated version -- you can basically stick it in third or fourth gear and do most of your around-town driving. The ride/handling mix is good, neutral with a nice ride over all but the worst potholes, and the steering is nice and quick, if a bit too light at speed. Feels like Hyundai basically left the suspension alone instead of being tempted to sport it up. That’s good, in my opinion -- it might have ruined the ride. The chassis could be stiffer -- I felt some steering column shimmy. Not much, but some. The price is fair, plus you get Hyundai’s gazillion-mile warranty. So there’s that. ASSOCIATE EDITOR WESLEY WREN: I thoroughly enjoyed most of the Veloster. It’s almost funny when the worst part about the car is its name -- but that’s for another day. Like everyone has mentioned, the power doesn’t really come on until later in the rev range -- but when it does, it’s immediate. The Veloster won’t set any landspeed records, but the rev-happy turbocharged 1.6-liter four-banger was a ton of fun around the city. I felt the suspension was set up just right for the audience of this car. I think that people will look at this little Hyundai at the same time as its front-wheel-drive competition in the Focus ST or the VW GTI, but also when looking at FR-S/BR-Z. This car hits an interesting price point, and isn’t unrealistic for a first performance-oriented new car for someone looking at the less-expensive side of things. Though, you will get more refinement with the VW GTI. The looks won’t be for everyone. Neither will the matte paint nor the accent stitching of the Rally Package -- but I think it works well together. I honestly wasn’t a fan of the Veloster when it first came out, but the styling has swayed me. It is such an incredibly odd car, it’ll never get lost in a parking lot. The downside of the styling is that it is aggressive-looking, so if you don’t like loud-looking cars, you won’t be a fan of the Veloster. The interior felt like what you’d expect from a $22,000 vehicle. It actually had a little more flair than I expected, but the materials were on the cheaper side. The seats were well-shaped and comfortable: probably the best “performance”-style seats in the low-price performance car battle. As Graham mentioned, this would be a perfect canvas to throw some bolt-on horsepower. A bigger turbocharger or some custom tuning could really wake this up -- at the price of your warranty of course. So if you’re looking for a fun hatch with loud styling, and can deal with driving around in a car with a name that would have fit in the last “Jurassic Park,” this might be an eye grabber.